"Crazier than a half dozen opium-smoking frogs.
" That`s how one observer described Guatemala`s former President Gen Jorge Ubico. 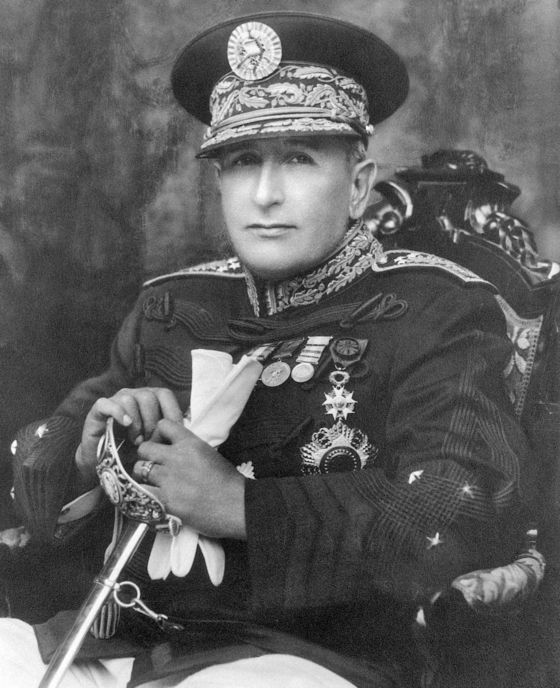 Like many 20th-Century Latin American dictators, Gen Ubico had a cosy relationship with the United Fruit Company, which became known as "el pulpo", the octopus, because its tentacles reached everywhere. Ubico passed a law requiring indigenous Guatemalans to work for landowners - which is to say the United Fruit Company, which owned most of Guatemala`s arable land. And most was left lying fallow, in case of future need. The company claimed the land was worth next to nothing, so it shouldn`t have to pay much tax on it. But then Ubico was overthrown in 1944. An idealistic young soldier, Jacobo Arbenz, rose to power, and he called el pulpo`s bluff. If the land was worth so little, the state would buy it and let peasants farm it. As Stephen Schlesinger describes in Bitter Fruit: The Story of the American Coup of Guatemala, the United Fruit Company didn`t like this idea. It lobbied the US government, employing what he calls "a corps of influential lobbyists and talented publicists" to portray Arbenz as a dangerous communist. In 1954, Arbenz was ousted in a coup and bundled on to a flight to peripatetic exile where he drank himself into oblivion. What does this have to do with refrigeration? Bananas. It is broadcast on the BBC World Service. You can find more information about the programme`s sources and listen online or subscribe to the programme podcast. One of the co-founders of the United Fruit Company was a man called Lorenzo Dow Baker, who started off as a sailor. In 1870, he had just ferried some gold prospectors up the Orinoco river, and his boat sprang a leak on the way home to New England, so he docked in Jamaica for repairs. Risky business He had money in his pocket, and he liked to gamble - so he bought bananas, backing himself to get them home before they spoiled. He managed it, just, sold them for a healthy profit, and went back for more. Bananas became a delicacy in port cities such as Boston and New York. But they were a risky business. Their shelf-life was right on the cusp of the sailing time. When they arrived, they were too ripe to survive onward journey inland. If only you could keep them cool en route, they`d ripen more slowly, and reach a bigger market. Bananas weren`t the only foodstuff prompting interest in refrigerating ships. Two years before Baker`s first journey from Jamaica, Argentina`s government offered a prize to anyone who could keep its beef cold enough for long enough to export it overseas. Packing ships with ice had led to costly failures. The rise of the `reefers` For a century, scientists had known that you could make it artificially colder by compressing some gases into liquids, then letting the liquid absorb heat as it evaporated again. But commercially successful applications remained elusive. In 1876, the French engineer Charles Tellier fitted up a ship - Le Frigorifique - packed it with meat, and sailed it to Buenos Aries as proof of concept. After 105 days at sea, the meat arrived still fit to eat. La Liberte, an Argentine newspaper, rejoiced: "Hurray, a thousand times, for the revolutions of science and capital!" Argentine beef exports could begin. By 1902, there were 460 refrigerated ships - or "reefers" - plying the world`s seas, carrying a million tonnes of Argentina`s beef, el pulpo`s bananas, and much else besides. Meanwhile, in Cincinnati, a young black boy was facing up to life as an orphan. Completing the `cold chain` He dropped out of school at age 12, got a job sweeping the floor at a garage, and learned how to mend cars. Frederick McKinley Jones would become a prolific inventor. By 1938 he was working as a sound systems engineer, when his boss`s friend - who ran a trucking business - complained about the difficulties of transporting perishable goods by land. Reefers` refrigeration units couldn`t cope with the vibration of road travel, so you still had to pack your lorries with ice, and hope you`d complete the journey before the ice melted. Could the brilliant, self-taught Jones invent a solution? He could. The result was a new company, Thermo King, and the last link in the "cold chain" - the global supply chain that keeps perishable goods at controlled temperatures. The refrigeration revolution The cold chain revolutionised healthcare. During World War Two, Jones`s portable refrigeration units preserved drugs and blood for injured soldiers. Today, the cold chain stops vaccines going bad, at least until they reach remote parts of poor countries with unreliable power supplies - and there are new inventions on the horizon to solve that problem. Above all, the cold chain revolutionised food. More from Tim Harford: How fertiliser helped feed the world The simple steel box that changed the face of global trade How the barcode changed the retail world TV dinners: The hidden cost of the processed food revolution On a warm summer`s day - let`s say 25C - fish and meat will last only a few hours, fruit will be mouldy in a few days and carrots might survive for three weeks if you`re lucky. In the cold chain, fish will keep for a week, fruit for months, and root vegetables for up to a year. Freeze the food, and it lasts for longer still. Refrigeration widened our choice of food: tropical fruits such as bananas could now reach anywhere. It improved our nutrition, and it enabled the rise of the supermarket. If your home has no way to keep food cold, you have to make frequent trips to the market. With a fridge-freezer at home, you can do a big shop every week or two. And that, in turn, transformed the labour market. Less need for frequent shopping freed up women to work. As low-income countries get wealthier, fridges are among the first things people buy. In China, it took just a decade to get from a quarter of households having fridges to nearly nine in 10. Economic logic Finally, the cold chain extended to perishable food the economic logic of specialisation and trade. Yes, you can grow French beans in France - but perhaps you should fly them in from Uganda. Different growing conditions mean this kind of thing can make environmental sense, as well as economic. One study found it was more eco-friendly to grow tomatoes in Spain and transport them to Sweden than to grow them in Sweden. Another claimed that it emits less carbon to raise a lamb in New Zealand and ship it to England, than to raise a lamb in England. Economic logic tells us that specialisation and trade will increase the value of production in the world. Sadly, it doesn`t guarantee that value will be shared fairly. It still exports bananas - hundreds of millions of dollars worth. It grows lots of other stuff, too, such as sheep, sugarcane, coffee, corn and cardamom. But it has the world`s fourth-highest rate of chronic malnutrition. Half its children are stunted because they don`t get enough to eat. Economists still don`t fully understand why some countries grow rich while others stay poor, but most agree on the importance of institutions that can tackle corruption and support political stability and the rule of law. According to one recent ranking of countries` institutions, Guatemala came a lowly 110th out of 138. There`s a name for poor countries with crazy dictators propped up by cynical foreign money: banana republics. Evidently, recovering from a Gen Ubico can take a very long time indeed. Tim Harford writes the Financial Times`s Undercover Economist column. 50 Things That Made the Modern Economy is broadcast on the BBC World Service.